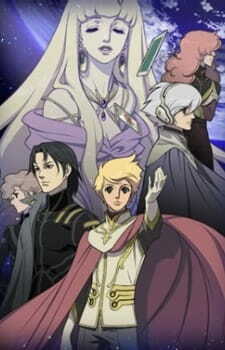 After watching one of the greatest shows in the later years, and knowing how overlooked it was due various reasons: the simultaneous arrival of new potentially more appealing series like Claymore or Lucky Star, the possibly not so appealing genre, and the unique art style; I felt compelled to right a review on Terra e.... A show that consistently climbed the ladder of my top shows the season, and that finally ended up in my top 3 of all time. The review will be long, since the series deserve it, and since I'll try to look at it in detail (yet keeping it spoiler free). Terra e... is a remake of an old 80's movie that was adapted from a manga from the same year. It fits on a very specific sub genre of Science Fiction, referred to as Space Opera. So expect an outer space futuristic setting, large scale space battles, a large cast of characters, supernatural abilities, and one or two typical 80's cliche. While this may seem like a not so viable mix, the reality is that it works quite well. To be honest, the show is a slow starter. It will not sweep you off your feet from the beginning. Instead, it will grow on you as it grows in quality itself, and at some point you realize your initial skepticism is gone and all you want is to see what the story reserves next. The Story tells the tale of two races, the Human and the Mu (who though joined by blood, have yet failed to have a peaceful coexistence), and the events that led to their inevitable conflict. It is quite the emotional rollercoaster, and it starts quite light themed, with emphasis to friendship and peace. Yet as the show progresses, it grows darker and darker and death, sorrow, fury, vengeance, guilt and war become an integral part of the storyline. Storyline that is spread out through a wide range of years and concentrates attention in the life of the two main characters. (since their coming of age to their adulthood). The pot shifts it's focus from one to another from time to time, and it does so in the form of two separate arcs for the first ~10 episodes. As the anime progresses however, the alternation becomes less spaced and finally inexistent, as number of events draw the main characters and their respective races to the inevitable clash. The characters and their development are without a doubt the best part of the show. Looking at such an extensive cast, I would never have imagined they could suffer so many changes throughout the series. The two main protagonists, Keith and Jomy (who are first presented as young teenagers), are the best example of this as they both undergo major character development. They seem to be the two sides of the same coin. Each of them faces a large amount of heavy responsibilities and hardships since their youth to their adulthood. And each choses a different path as they climb to the top. Where one is respected the other is feared, while one created friends the other spawned enemies. Both filled with sorrow and grief for their losses, and yet the bearers of great determination. But not only of Jomy and Keith lives the story. The primary supporting cast constituted mainly by Shiroei, Soldier Blue, Physis, Tony, Matsuka, Swena and Sam also undergoes great development. And surprisingly enough, also does some of the secondary supporting cast like Karina, Artela, Murdock or Zel. There will be characters to like, characters to dislike, characters you wish you had seen more of, characters you wish you could beat the crap of... but all in all, they all have their space and role on the outline of the plot, and it's hard to stay indifferent to them. Specially after the amount of events/hardships they are forced to suffer. A few words to the ending now. To be honest, I think it was a bit rushed. But even so, it was one of the best endings that crossed my eyes, and yet I have the feeling that one more episode would have made it the best ending of all. There were a small amount of plot lines that were only explored superficially, like the origin of some characters, past conflicts etc. And there's also one or two of inconsistencies in the storyline. But they're not enough to taint it. The overall storyline, and specially the characters and their development are top-notch. Although the Art is certainly the most unique aspect of show it is also a double edged knife. As I mentioned before the show is a remake of an old 80's movie with the same name. And as so, the producers decided to preserve the 80's feel in the styling of the characters and environment. Yet now reviving the &quot;antique&quot; style with nowadays animation quality and computer generated imagery. While some people, like me, will find this a plus, there will be a relatively large amount of audience that will be thrown off by it. Still, the animation starts at a high quality level. That quality does indeed decrease a bit around the middle of the series, but quite surprisingly, after less shinny period it takes a turn for the best. Not only does it improve significantly, but actually surpasses the overall animation quality of the earlier episodes. And the art style evolves quite a lot in that period. Movement becomes more fluid, characters more detailed, and the 80's feel more faded. It is also great to see the characters physical appearance change, as they age during the storyline. As I mentioned before there's a large use of CGI, specially in spaceships and space warfare. The CGI's may not be as shinny as those seen in shows like Last Exile, but they are still rather good and quite well used throughout the entire series. Sound and Music are one of the best things the show has to offer. Great sound effects, and solid voice acting as normal nowadays. The creators put together experienced voice actors like Takehito Koyasu, Tomokazu Sugita, Mitsuki Saiga with less experienced ones like Marina Inoue or Motoki Takagi, creating a balanced team that ended up fitting the needs of the show quite well. Each seiyuu performance is quite good, and fitting to the character. But even so, some performances exceeded the overall great voice acting quality. This is the case of Jomy, Keith and Tony's voice actors for example. Still, neither voice acting nor sound effects are the shiniest aspect on this category. It is yet the Music. Terra e... put together some of the most epic, well devised themes and choral pieces I've heard. The music not only superbly supports the show, borrowing sorrow, cheerfulness or thrill to events, but at times even becomes the full back-bone of the scenes. The music made my skin crawl (in a good sense) a good amount of times. A truly outstanding work by Yashuharu Takanashi, who is also the author of the OST's of Gantz, Jigoku Showjo Series, Mononoke and Seto no Hanayome. Surely, the music genre may not appeal to all if listened outside the show, but it could not befit anime's identity more. The music brilliance does not stop merely at the instrumental themes though. It is also present in the OP/ED themes. I had not seen a single series in which all of them appealed to me. Yet that fact changed after seeing Terra e.... All 4 are great on their own style. Granted, not everyone will enjoy the all four, but there will be at least one song that will appeal to you. And leaving appeals aside, the songs where clearly not left at random. They strategically mark a shift in the series. From the lighter and cheerful beginning, to the darker and more dramatic ending. The Enjoyment is the most subjective rating not only in this but in any anime. Great storytelling, epic music, unique art and story line, and a large cast of interesting characters culminated to give me an outstanding amount of enjoyment. Outstanding enough to be in my top 3 overall. So in Conclusion, it's after seeing series like this, I'm glad I watch anime. It's good to know that there are still series that can sweep me off my feet when I less expect them too, and take for a memorable ride. What awaits you in Terra e... is an epic, unique, dramatic storyline, telling the tale of two races and the events that led to their inevitable conflict. With a great and wide cast of characters that undergo the most dreadful events and suffer major character development. Outstanding music that supports the series superbly and shines on it's own. An Art style with an 80's feel to it, that can either hook you from the first moment or, more likely, throw you off at first... And yet, given the chance it will probably win you over in due time. With a good rewatch value, specially if like myself, you've seen the series as the episodes aired. Manga, Movie, Anime: Toward the Terra (known as Terra E in Japan) was originally a manga created by Keiko Takemiya (famous for her work on Andromeda Stories), and originally ran in Asahi Sonorama's Gekkan Manga Shoen from the January 1977 issue to the May 1980 issue. The manga was licensed Stateside by Vertical (who also licensed Tezuka's Ode to Kirihito and Buddha), and the third and final volume was released on June 26th, 2007. Toward the Terra won the Seiun Award (a Japanese sci-fi award) in 1978, and won the Kodansha Manga Award in 1979. Fumino Hayashi did a spinoff called Terra E... ~Aoki Kobo no Kiss~ that centers around one of the main characters, began running on September 27th, 2007, and is ongoing in Square-Enix's GFantasy magazine. Toward the Terra was adapted into an animated movie in 1980 that was produced by Toei Animation (famous for their work on all seasons of Sailor Moon and Dragon Ball) and directed by Hideo Onchi. The Right Stuff International licensed it Statesdie, and released a subbed version in 1994. This will not be covered in this review. Toward the Terra is a twenty-four episode anime that was produced by Minamimachi Bugyoushou (famous for their animation assistance on Jyu-Oh-Sei and Mushishi) and Tokyo Kids (famous for their work on the Sayuki OAV and Gakuen Heaven), and directed by Osamu Yamazaki (famous for... y'know, I can't really find anything). It ran on Japanese TV from April 7th to September 22nd of 2007. Bandai has licensed it Stateside, and has yet to announce a release date. Story: Toward the Terra takes place a few thousand years or so from the present, in a time where humanity's screwed up Earth and has colonized other planets, and is more or less controlled by supercomputers. Psychics called the Mu are being born, and humanity, as is always the case with these sorts of series, fears them and attempts to destroy them at every turn, and the Mu attempt to rescue children when they awaken, at risk of their otherwise being destroyed. All the Mu want to do is go back to Earth. And into all of this steps Jomy Marquis Shin, a dormant Mu who is rescued by their leader, Soldier Blue. This sounds like your standard sci-fi story, no? Well, here's the thing -- it's not. And the main reason for this lies in how they choose to tell the story. The story is undeniably centered around young Jomy, and driven around his development and experiences. But at the same time, there's an extremely extensive cast that all gets some degree of development, and actually ends up playing a major role in how events play out. Characters who you think are only going to be involved in minor ways end up playing major roles in the show later on. And the sheer range of the story can be best summed up as freaking EPIC. Not only does the story cover the happenings surrounding individual characters, it also focuses on the Mu and human races as a whole, AND the interactions between the two races. As if this wasn't enough, this entire series covers about two or three decades of all of this; you get to watch character from when they are kids up till they're adults, and watch them through the whole span of their life. And the story itself starts out light, but steadily gets darker and darker throughout the series, with lots and lots of death and conspiracy and all sorts of lovely things. All in all, several kinds of amazing. Art: The animation for this series is pretty high-quality. The 2D animation is fairly smooth; however, the CG tends to stand out some when it's used (but, then again, it's only used on its own, and never blended, so that works out pretty well). Music: There are two OPs and EDs each for this series, and none of them particularly stands out; the OPs and second ED are your standard upbeat pop numbers, and the first ED is the standard female ballad. The background music for this series, though, is some of the first that I've actively noticed for a while. Ethnic instruments are thrown in with the standard Western orchestra, and the music is just awesome in general. Seiyuu: This show has a lot of talent that I recognize and love -- Sanae Kobayashi (Lucy/Nyuu of Elfen Lied and Daedalus of Ergo Proxy), Tomokazu Sugita (Mayama in Honey and Clover) and Takehito Koyasu (Hotohori of Fushigi Yuugi and Touga of Revolutionary Girl Utena), most notably. All the other performances in this show are pretty good, as well. Length: Perfect. There's no filler whatsoever, and the story moves along at a good pace. The only thing I would want would be an OVA to explain what happens between the end of the last episode and the bit that's shown after the credits, because it just begs for explanation, how things went from the way they were to that, to be vague at risk of spoilers. Overall: An excellent, epic sci-fi story with an excellent focus on characters, beautiful background music, and good animation and seiyuu. Another one of my top picks. Watch this. NOW. As long as I live, I'll probably never understand those people who rave about Terra e as if it were a great piece of literature, or indeed, good enough to be considered a piece of literature at all. For something that whose source material won the Seiun Award, and whose manga won the Kodansha Award, Terra e manages to be.... I'll be honest here. It's really, really bad. Terra e is a sci-fi piece. That is about all one can describe, because the setting is indeed quite plain. Although earlier episodes would have you believe that it takes place in some sort of... Orwellian nightmarish environment, for all intents and purposes, Terra e has a vanilla sci-fi setting. Humanity has polluted the Earth to a state in which it is uninhabitable. Humanity has taken to the stars, colonizing and terraforming planets to live on, all the while trying to terraform the Earth back into a liveable state. As a result of the crisis situation, a fascist government has managed to seize power, and their administration seeks to cement their control over humanity, through, for example, destroying rogue elements such as the mutant "Mu", and engaging in a vaguely 1984-like system of population control. Taking inspiration from 1984 would, generally, inform one that the show would have dystopian elements, but strangely enough, all effects of the fascist actions of the government be waived as convenient for the plot. The psychological effects of having a heavily controlled and totalitarian populace never strike the main characters, while the main characters will also never lose any information relevant to the plot, mind-wipes to ensure obedience be damned. As a result, any serious message the show tries to convey is simultaneously undermined and made into a laughing stock. I do not know if the director seeks to destroy his own show, but this is a disturbing trend that permeates this show in general. Humanity is supposedly controlled by supercomputers, yet humans are still shown to make the relevant decisions when necessary. Everyone is brainwashed to follow the SD government, but there are characters who still elect to dislike the government, and rebel, and they are not dealt with until they commit serious crimes, and expose state secrets. People are raised like sheep, yet the cast seems to undergo a normal schooling environment, and even military academies bear more similarities to modern day education than differences. I could go on, but I fear that I am belabouring the point. Other instances of this undermining (for it is far too common) will no doubt show up as I go on. The main plot of Terra e concerns the "Mu", a race of psychically endowed mutants exiled from humanity, who seek to find, and recolonize Earth. They do this all the while evading attack from the dictatorian "SD" government, who seek to destroy rogue elements that threaten their control over humanity. The main character, Jomy, is one such (young) Mu. While the Mu are initially peaceable, after some time, the frustration of the new generation of Mu born in exile boils over, and under the leadership of Jomy, they elect to wage a war against the SD government and the humans under its jurisdiction, to claim Earth as a homeland for themselves. They do so by obliterating SD ships with overwhelming firepower, taking entire planets hostage, and being every bit as cruel as the humans which they supposedly despise. If I didn't sound very sympathetic to the cause of the Mu, I do not apologize. While the director undoubtedly wants us to side with the Mu, I must find that his message often works in reverse. Terra e shows us the cruel side of humanity, espoused in its finest agent Keith Anyan, a cold, callous man captured by the Mu who has no qualms taking hostages to ensure his escape, and killing them when he has no further use for them. The Mu call him a monster, but yet just days later they indulge in monstrous behaviour on a much larger scale, destroying entire fleets while accepting no surrenders, and taking an entire planet of civilians hostage. The new generation of Mu, especially Jomy, do this without batting an eyelid, and indeed, they even revel in the bloodshed. The new generation are revealed, in the end, to be power-crazed, psychotic, and ruthless to those who they perceive to be beneath them, even other Mu who are less powerful psionically. Yet, the viewpoint is constantly with the Mu; we see how the Mu struggle to survive and build a homeland for themselves in an abandoned colony in deep space, we see the conflicts and disputes between different Mulian factions firsthand, we are shown how humanity tries to destroy the adopted homeland of the Mu through orbital bombardment, all the while in a sympathetic light to the Mu. We are left in doubt just what the director wants us to feel. Are we to pity the Mu for their depraved state of affairs, brought about by persecution? Are we to hate the Mu, for their cruelty and inhumanity? Niehter interpretation can be supported, due to the conflicting messages that the director sends us, that undermine either intepretation. The most striking artistic decision about this show, I would think, would be the decision not to tell a chronologically smooth story, but rather to have the plot move in a series of jerky timeskips. While novel, this idea is nonetheless again undermined (yes, again) by the scriptwriter and art director. Little indication is given as to the length of time that has elapsed, leaving the viewer to pick up the pieces. As a result, many episodes, especially early on, feel rushed and disjointed, and a nagging feeling surfaces that there should have been additional episodes to fill in the gap, or at least, changes in the way characters and the backgrounds are drawn to reflect the time gap. When a 14-year old looks exactly the same as he does when 26, the audience is left pondering just what the art director was thinking. Nonetheless, the rest of the art is drawn surprisingly well, from the beautiful clips of deep space, to still shots of nebulae and celestial objects, to wonderfully detailed and realistic spacecraft. The character designs may be dated somewhat, which may be quite jarring at first, but after a few episodes they grow on the viewer. Sound is nondescript. It's used when appropriate, but is nothing to rave about. Half the cast are idiots, the other half of the cast are assholes, and all of them, in all honesty, had much room for improvement. While many characters do develop as the story progresses, it is usually to their moral detriment, and attracts the audience's disgust. You have cold cruel hypocrites like Jomy and Physis, power-crazed berserkers like Tony, arrogant and beastly snots like Shiroe, disgusting psychopaths like Karina, naive and temperamental youths like Kim and Sam, and old men rooted in the past like Zel and Harley. To be fair, some of these characters aren't as bad as I make out, Sam and Harley notably, but by and large, most of them are. Blue, Keith and Matsuka, the only main characters worth a damn, are not able to carry the show due to the amount of screentime they are given.The amount of sympathy the rest of the cast attracts is basically 0. When main characters die, complete with a death montage, flashbacks, and insert songs, I don't shed tears out of joy. I shed tears out of happiness, because I do not have to see that idiot again. The voice acting is a mixed bag. While the main characters, especially Keith and Blue are voiced pretty competently, many side characters, Physis being a prime example, have horribly grating voices. But at the very least, they do not get enough screentime to get the viewer overly annoyed. It's still nothing to rave about, of course. To be succint, Terra e is what I would term: wasted potential. Given its unique setting and novel storytelling method, if handled competently, it could have been a deep and cutting look into the human psyche. As it is, it is merely a glaring example of how not to do it: make a contradictory, meaningless, unenjoyable trainwreck of a show, with no coherent message. I've heard some people describe it as en epic anime, and must respectfully disagree. While Terra e strives to be an epic anime, the total lack of sympathy that the audience feels for any character, as well as the lack of a coherent message gives it an extremely different, in fact almost entirely opposite kind of mood - Nihilistic. This anime shocked me in many ways. Firstly, it's a freaking 1977 manga story which already leaves a big generation gap between us. Secondly, it's omg science fiction which I have never liked before. Thirdly, what's with that weird drawing. Little did I know that all the above factors matter not at all. The superbly crafted storyline coupled with that awesome character development easily let this anime to be one of my top favourites. Gotta mention too that the opening and ending songs for this series were well-chosen and fitted the story nicely. It's therefore very hard not to let your emotions be tugged along. Before I knew it, I was hooked onto the fast pace of the story and it ended in a blink of an eye. The after thought lingered for quite some time because the ending, or rather, the story itself keeps you thinking. In particular, the development of the main protagonist enticed me so. He was such a wimp to begin with but during the course of the story, he developed such a notable charisma that you can't help but feel for him and the Mu. I'm very sure that everyone who have watched this is equally drawn to him as I am. To cut it short, I've only got one word to say about this series - Awesome! !